The Roman Hill district of Lowestoft is fairly central, and consists of late 19th century terraces and artisan's workshops, some of which are still in use, especially towards Katwijk Way, the inner ringroad. The grid pattern of the little houses is thoroughly urban and domestic, familiar from Ipswich and other larger towns. Set on Roman Road, one of the roads through the area, St Andrew is most striking. There is no other church like it in Suffolk. It is a substantial grey stuccoed block, that appears to have two storeys (it hasn't), and it fits in well with the line of houses, despite its colour. On the day I first visited in 2000, two workmen reroofing the west end of the building showed me that, underneath the cement, the church is actually built of red brick, and I suspect that it was rendered some time later than its date of construction. The windows are rather grimly rectangular. It has to be said that it looks like a small factory. Sam Mortlock records that St Andrew was intended as a First World War memorial for the dead of St Margaret's parish, although this may not be the case, as we shall see. The design, by Edward Tench, was put forward in 1920. The church was finally built in 1934, although here is none of the excitement here of the apparently contemporary Ipswich All Hallows, for instance. A modern hall has been built at the west end, and hall and church share a porch. Stepping inside, the church is thoroughly domestic, obviously well used and cared for. The chancel and sanctuary are curiously Victorian, as are the benches. At first, I wonder if they came from the lost church of St Matthew, which was probably destroyed in the First World War, but Mark McCaghrey, then the Vicar of St Andrew, solved the mystery for me; the benches came from St Peter, and the sanctuary fittings from St John. 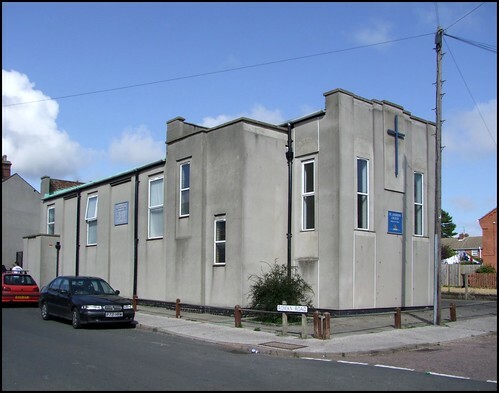 Both these churches were declared redundant in the 1970s, and demolished. Mark McCaghrey was kind enough to give me a brief history of the parish: There has been a church on the site of the current St. Andrew's since 1902. I understand that there was a temperance hall on the site before that, but this may be no more than a rumour. In November 1902 the foundations were laid for a corrugated iron church which was situated North-South and which was dedicated to St. Andrew. This was entirely appropriate given that the majority of the local housing was built to serve the fishing industry. On the outside of this church after the war a local family built a war memorial to the war dead. I think therefore that your information that the church was built as a memorial to the dead of St. Margaret's parish is inaccurate. St. Andrew's had a reputation for being Anglo-Catholic in its worship style. In 1932 Canon Hawtrey Enraght came to St. Margaret's and undertook to replace the existing corrugated iron building by the building that remains - which is actually made of red brick as you said. It was dedicated on May 13th 1934 and as you know its aspect was changed to East-West. The church had to be rendered (unfortunately in grey) because the red brick is extremely bad quality and porous and the mortar appears to have been made with sand taken from the beach - and therefore contains salt - which has made it crumbly. The render is therefore there to protect the brickwork from the rain. I personally would love to paint it - grey is not a good colour for a church in my view.On the inside the church was also red brick and the current interior is plasterboard placed over the inside of the church at the same time as the render for the same reasons. The window shape is original although the windows had to be replaced owing to rust and vandalism. We had hoped to put some kind of stained glass in the two windows at the East end but were unable to agree a design with the Norwich DAC. Who knows what will happen in the future? During the 1960s St. Andrew's became part of the parish of St. John's and much of the Anglo-Catholic aspects of its worship were discontinued and removed. It became "Low" in its style which is its continuing tradition today as a separate parish. Mortlock thought the forest of light fittings discordant, but I thought them very good, like a crown of thorns above the nave. But if you want to see them you will have to hurry, because this successful church community has big plans. I saw them up on the wall as I stepped into the porch. Over the next couple of years, the church will be completely rebuilt, not only to provide a church suited to the 21st Century, but a resource for the local community. When I came here in 2000 I reported then that, in a town not short of understated modern churches, St Andrew obviously had a strong place in its local community, and I liked it for that. It continues to be true.